Do you need help with database programming? Do you have database development projects that just aren’t getting done? Are you frustrated by incomplete or non-existent database design documentation? If you answered yes, ISG can help. Since 1993 TheIntegrated Solution Group has designed and built hundreds of custom software applications, many incorporating complex database foundations. Our experienced database consultants can help you define your database requirements and our database designers can build robust, documented database models to be used by the database development team. Custom database programming requires significant attention to detail. Our database programming experts have years of application development and know how to work effectively with relational database designs using custom grid controls, stored procedures, database triggers, and other performance enhancing techniques. ISG’s database programming staff uses the most current Microsoft framework tools to provide .NET web database programming and C# smart-client database programming, as well as the latest data access tools including Linq, Dlinq, Xlinq, and SubSonic data ojects, combined with traditional database enhancement methods such as the development of stored procedures and database triggers. ISG also provides database programming services for Open Source development projects. Does your organization need a database driven eCommerce web site? Can’t find an ‘out of the box’ solution that suits your requirements? 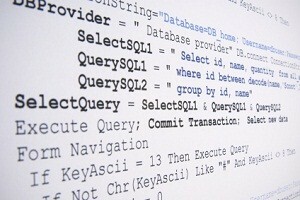 ISG can help with your web database development needs. We combine superior web database design and high performance web database programming to create an optimum professional database driven website for your business. ISG’s web database programmers use the latest .NET application development methodologies and web database design tools for our web database development projects. Our custom database development team supports current Microsoft web development technologies including .NET versions 1, 2 and 3, ASP.NET, and VB.NET. If you have other business processes that need to communicate with your corporate website, our database integration team can help you tie it all together. Contact The Integrated Solution Group today for a free, no obligation telephone consultation to review your custom database programming and custom database driven web site development requirements. Our experienced staff will provide basic feedback to help you evaluate the complexities of your planned endeavor. ISG database programmers are available for Internet based database development projects or, if necessary, for on-site database programming assignments. Don’t let your business fall behind your competitors. Our mission is to help our business partners maximize their performance by leveraging database development technologies. We have many, many years of software design and database programming experience and we enjoy sharing this knowledge with our customers. At ISG we are committed to assisting our customers in finding the best possible technology solutions for their custom database software applications. We can help you design high performance custom database software that will get the job done for your business.